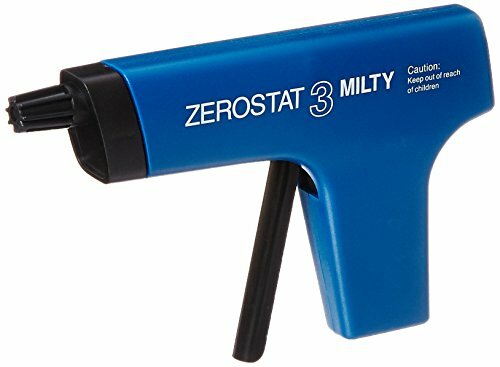 Milty Zerostat 3 Anti-Static Gun removes static electricity from the surface of any LP, perfect for record cleaning. This device is an anti-static generator which has numerous applications, but for audiophiles, the main use is to remove the static charge on the surface of a record. A slow squeeze of the Zerostat "trigger" releases a steady stream of ions, which removes the built-up static charge on the surface of an LP instantly. The Zerostat is perfect for eliminating the static charge that builds up due to the rotation of a Record Cleaning Machine and its suction tube and eliminates this charge with a slow pull of the trigger. The Zerostat antistatic gun was discovered to have great applicability for use in photographic darkrooms to remove dust from film and negatives.